Guardians Of The Galaxy: Does it live up to the hype? But Marvel realized something very elementary – you cannot make 100 movies on Thor, Iron man, Captain America and Hulk. So they had to test the water with some of their lesser known properties to see if they worked. But maybe they were OUT OF THEIR MINDS OR maybe the memo changed from LESSER KNOWN to COMPLETELY UNKNOWN property by mistake and someone had a bright idea to make a Guardians of the Galaxy movie! Guardians Of The Galaxy, first seen in Marvel Superheroes in 1969, has been re-casted and rebooted about a zillion time and they never have had much to do with anything big really. Even avid comics readers have only some vague idea that they exist. After 2011, we are getting a brand new Marvel movie with a budget of 170 million that was touted as the Gamble of the year. And BOY, has it paid off! The movie starts with our Chief protagonist Peter Quill (the awesome Chris Pratt;Parks and Recreations) getting alien abducted in his childhood in 1988, with bright shining light and a beam and all. Then we move ahead 26 years in future, where he has become a self-styled outlaw, “STAR LORD”, who by day is a treasure hunter (read a tomb raider, thief) and by night a gentleman (read romancer of all that is beautiful). We start on a desolate planet in the manner of Indiana Jones and temple of Doom-esque, but with our hero listening on his trusty Sony Walkman and soundtrack erupts with Redbone’s “Come and get your love”. It is one of the many 70s classic that will follow and keep the tempo upbeat. From the ruins Star lord manages to get a shiny silvery orb under the nose of Korath, the pursuer, a Kree warrior, and we know that there has to be more than meets the eye with this orb. Soon Star Lord meets other characters while he is trying to hawk this orb. Rocket, (voiced & emoted by double Oscar nominated Bradley Cooper; Hangover, Silver lining Playbook, American Hustle) a highly intelligent anthropomorphic raccoon, who is an expert marksman and brilliant tactician and works as a bounty hunter. 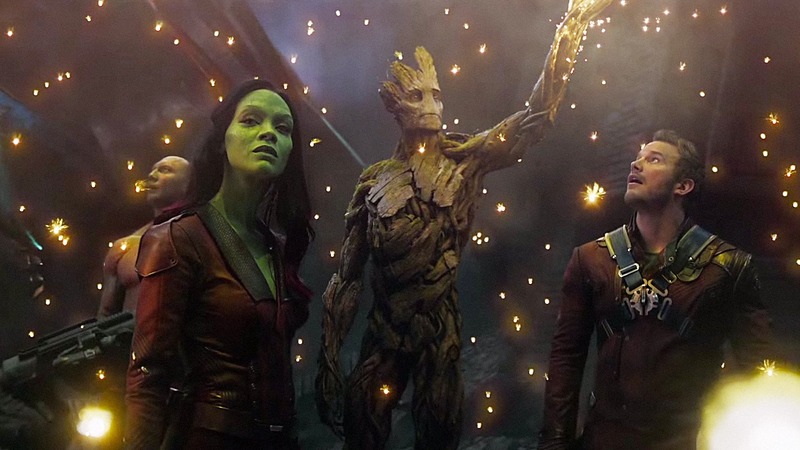 Groot, (Voiced & emoted by Vin Diesel; Fast & Furious, Pitch Black)a sentient tree on a noble ancient sapline (Monarch of planet X), working as a thug with Rocket, who can only speak 3 words in same order “ I am Groot”. While it is not clear in movie, Groot is extremely well educated with a brilliant grasp of Quasi-dimensional super positional engineering. Drax the destroyer, (Dave Batista; WWE champion) an alien of unknown species, who has only one goal in his life – revenge the death of his family at hands of Ronan. However, Forces of evil have other ideas, and will stop at nothing to get it. Ronan the accuser, (Lee Pace; Pushing dailsy, the hobbit )as a fanatic Kree warrior and Nebula, ( the lovely Karen Gillian; Doctor Who) not so lovely adopted daughter of Thanos provide formidable enemies for them. GoTG feels both epic and intimate. The movie may have a threat that could wipe out the galaxy, but it is more focused on our heroes(? ), on how they meet, fight and band together. It is not that the story is not interesting, but you will find yourself caring less and less about that compared to what is happening with these guys! Not that the movie misses out on the battle front. While the story may be a very simple one, we still have BREATHTAKING view of the infinite beauty of space all the time. There are some really good hand to hand combat, some fun Gun battles and movie is littered with fantastic space ships dog fights. Chris Pratt IS the Star lord, no doubt about it. He is equal part cocky, heroic and funny. He is emotional and irrelevant, rogue and heroic. He is a romantic and a womaniser. He is equal part young Harrison ford and Andy Dwer. You cannot stop yourself laughing with him and you cannot stop felling his pain. Watch out ladies, he is there to steal your heart! I definitely see big things for him in future, both in these movies and out of it. He reminds me both of Young Harrison Ford and Robert Downey Jr. in Iron man.An awesome casting by James gun for casting a guy who was a fat funny guy on a sitcom. 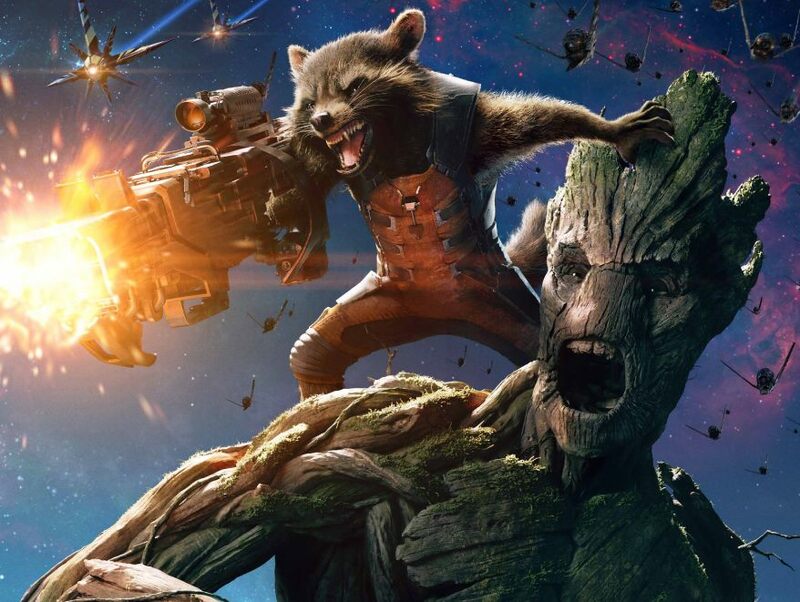 Groot and Rocket raccoon has the potential to be this generation’s R2D2-C3PO. Bradley Cooper is JUST AMAZING as RR, he digs deep in his comedy sense, and delivers a stellar performance as Sarcastic yet vulnerable raccoon. He is the rudest super hero we have had yet, and the most fun! Vin Diesel may just have three words to say, but that is enough to steal your heart. He is just SOOOO DAMN CUTE! And just when you think he cannot be any cuter, he becomes the cutest thing you ever saw! Both characters have been created SPLENDIDLY with a very detailed CGI and emotions provided by them, especially by Vin Diesel are BRILLIANT. 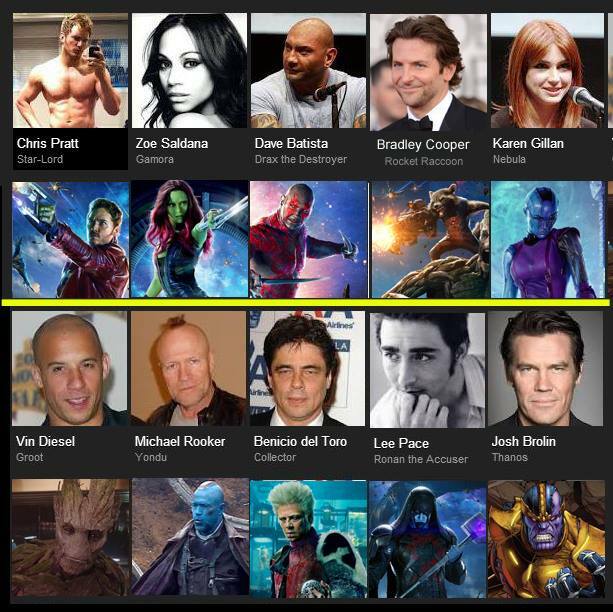 The shocker of the movie is Batista as Drax. He has some of the best lines in the movie, and his delivery and timing is incredible! WWE , you are wasting the talents of this guy! John C. Reilly as a nova corpsman and Michael Rookeras Yondu are well written and pleases us in their short time on screen. Lee Pace is imposing and Sinister as Ronan, and Karen Gillian as nebula is suitably cruel and ruthless. While they look brilliant and are well acted, they don’t have that much to do in the movie, one of my disappointment with the movie. Like I said, the movie really isn’t about THEM. One of the big star of the movie is its Sound track. Yeah, hooked on the feeling is there! Each song is well placed and takes the movie scene to another level, be it Stralord prancing around on a scavenging mission, a jail break or Starlord and Gamora standing on a balcony in an intimate moment. The reason why this movie is sweeping the box office is because this movie is for everyone. Children-adult, male-female. It has comedy-tragedy, rakishness-heroism, action-intimacy, friendship-cruelty. Whoever you are, if you go to watch this movie , you will not be disappointed. The movie is unconventional, irrelevant and funny as hell! If you were wondering if this movie, dubbed by Entertainment magazine as the “coolest, craziest, funnest gamble of this summer” works, then answer is an emphatic yes. Marvel, you can do nothing wrong, and we await such further movies, who cares if we don’t know the characters! So If you are a casual movie goer, I rate this movie as 8/10. If you hate scifi movies, I still rate this 7/10 for you. If you live scifi movies with special effects, I rate this at 9/10. For marvel fanatics like me, however, this movie is a solid 9.4/10. This is the best marvel movie yet, this is the most fun movie of the year.It is also the one of the best movie if you are going with family, with children. If you see this movie and you like it, please try Farscape, you will love it as well. 1) SOUL GEM: Control, steal, manipulate and alter souls, and opens a pocket universe. It is Sentient and hungers for souls. 2) TIME GEM: Controls past, present, future, ageing. Can send entire universe into time loops. With full power Gives Omniscience. 3) SPACE GEM: allows user to exist in any or all space, move anything anywhere, warp space. With full power gives Omnipresence. 4) MIND GEM: can access thought and dreams of entire universe at full power. It is the manifestation of subconscious of universe. 5) REALITY GEM: can change reality in anyways, even against the laws of the Physics. 6) POWER GEM: can access to all power that ever was or ever will be. Takes other gems to full power. Gives Omnipotence. Now, James Gun has confirmed that despite change in colour, GoTG gem is Power gem. That is with Nova corps. 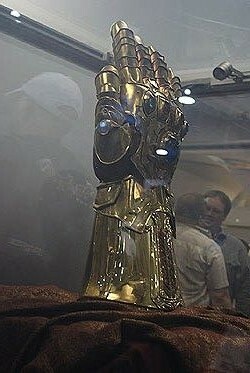 Once Thanos collects all the gems he will create infinity gauntlet and became God like, we can expect that in Avengers 3 in 2018. In comics, Thanos wipes out half the universe with gauntlet in seconds. WHAT DOES THIS MOVIE MEAN FOR US? This movie was considered a massive gamble for Marvel. The projected week end for first week end was initially 55 million $. By the time movie was about to be released, it became 65 million. The movie took 11.2 million $, highest of the year on Thursday night and broke the whole maths. It ended up having 94.2 million weekend behind only Transformers and Cap 2. And since then has crossed Cap 2 earnings in first week and 2 million behind transformers. This is particularly impressive because Summer box office this year has been a MASSIVE failure. This shows that if you make a good movie, people will flock to the theaters even if it is about superheroes that they have never heard of. And this established Marvel is the current juggernaut of box office. The day after GoTG box office results came, Warner brothers moved their Batman vs Superman movie away from date of captain America 3. Coincidence? I think not. This opens up Marvel to create movies of their lesser known franchises with confidence. We should have casting for Doctor Strange movie in a month. A release date of 28-Sep-2017 has already been given to GoTG 2 – War of kings. That is a storyline that shows battle between 2 of marvels biggest galactic empire Kree and Shi’ar. That opens up entry of Black bolt and other Inhumans. It has been suggested that Vin Diesel may take up Black bolt’s role too. For those who don’t know him, his power is voice. When he whispers, cities fall down, when he shouts, planets crumble. 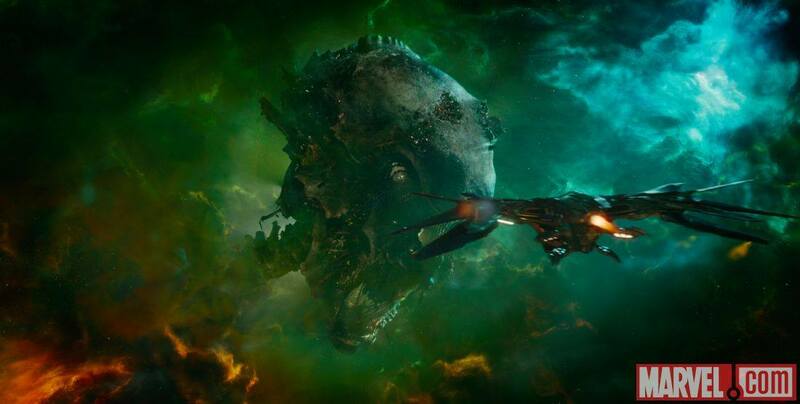 GoTG and Avengers should collide in Avengers phase 3 and will almost 100% come together in Avengers 3 in 2018, which is likely to be Thanos Imperative. I, for one, cannot wait for this wonderful stories!